St. Martin's Griffin, 9780312283414, 240pp. Janis Cooke Newman first saw the baby who would become her son on a videotape. He was 10 months old and naked, lying on a metal changing table while a woman in a white lab coat and a babushka tried to make him smile for the camera. Four months later, the Newmans traveled to Moscow to get their son. Russia was facing its first democratic election, and the front-runner was an anti-American Communist who they feared would block adoptions. For nearly a month, the Newmans spent every day at the orphanage with the child they'd named Alex, waiting for his adoption to be approved. As Russia struggled with internal conflict, the metro line they used was bombed, and another night, the man who was to sign their papers was injured in a car-bombing. Finally, when the Newmans had begun to consider kidnapping, their adoption coordinator, through the fog of a hangover, made the call: Alex was theirs. 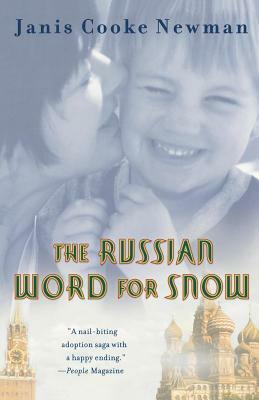 Written with a keen sense of humor, The Russian Word for Snow is a clear-eyed look at the experience of making a family through adoption. Janis Cooke Newman, author of The Russian Word for Snow: A True Story of Adoption, is a frequent contributor to Salon.com and other magazines. Her stories have appeared in several anthologies, including Travelers' Tales. She lives in northern California with her husband and their son.